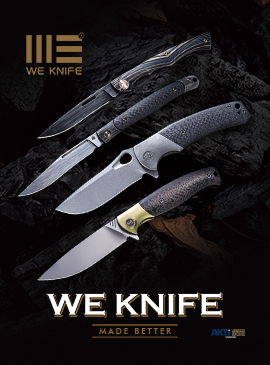 The knife maker and designer Ken Onion has designed and patented an amazing amount of mechanisms and designs during his illustrious career, earning in 2008 the well deserved entry into the "Hall of Fame". 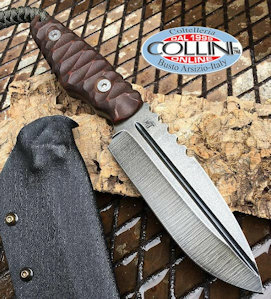 Known as one of the most innovative and successful designers of the last few years, Ken Onion is always able to surprise with new ideas, such as Field Strip technology, which allows one to disassemble the knife without the need for tools, thus helping to clean and maintain the knife in the field. The most sceptical will think that this is mostly an exercise in style, some will wonder what is the real necessity of disassembling their knife in the field, while others will appreciate the brilliance of the system and the effort to make innovations in a sector where novelties are becoming increasingly rare. Everyone will draw their own conclusions on the basis of their experience and needs, but let's see in detail how the new Field Strip technology is built. The first step to disassemble the knife is to move the lever on the pivot, which is connected to a hexagonal inner ring that, by rotating, unlocks a primary pin, also with a hexagonal head around which the blade rotates. The second step involves rotating the release wheel on the bottom of the handle, which will loosen and release the handle scale. In this way, in a few seconds (about 8-9 which, with a little practice, can also be reduced) the knife is completely disassembled into three pieces. Just pull the blade out of the pivot and proceed with the cleaning of the various parts. All internal components (stop pin, spacer and washers) are locked in such a way that they can't be lost during disassembly, making this operation practicable in any condition. The blade, with drop-point profile and hollow grind, is equipped with a not excessively pronounced swedge that ends on an effective tip. The steel used in this model is the 1.4116 (hardened at 55-57 HRC), a German stainless steel that has always been used in kitchen knives but found to be widely used also in sports knives. The blade, like the steel liners, has a pretty stonewash finish that emphasizes a classic, simple yet functional blade shape. The outside appearance of the knife is rather significant and mainly oriented towards the functionality of the instrument, but there are also some aesthetic details that characterize the Homefront. There are some aspects of military inspiration, such as the oversized pivot embellished with a star and the flipper shape. For Ken Onion the creation of the latter, the only one blade opening system, was inspired by the bayonet muzzle-ring, adding a jimping along its circumference to enhance the grip. The blade rotates on teflon washers which, as mentioned above, are fixed on one side onto the handle scale (by means of two screws holding it along the edges) and the other one on the steel liner (compressing it between the pivot and the stop pin) so that when you completely disassembly the knife you avoid losing these screws. The opening is rather smooth and all the mechanical couplings are skillfully made. The stop-pin, fastened to the liner, fulfills its function thanks to the presence of a semicircular seat formed on the blade tang. The liner-lock consists of a flat spring of 1.27 mm thick. The steel liner is hidden in the scale and held in position by plastic pins shaped on the scale itself and locked at the bottom of the handle by the spacer. The handle - structured to include the Field Strip system - consists of two fiber glass reinforced nylon scales with a sort of geometric pattern. The molded scales features jimpings for thumb positioning. From the ergonomic point of view, the handle has a very simple but extremely functional shape. The grip on the instrument is firm and allows easy handling for any type of hand. The Homefront EDC features a deep carry pocket clip, configured only in tip-up position. The Homefront, thanks to its extreme lightness (122 g) it's easy and practical to carry in your pocket. The retail price of the Homefront EDC version on the various online stores is about $ 100.00 in the US and € 93.00 in Europe. The knife designed for everyday use has been tested on a qualitative level by performing, as usual, some cutting tests on various materials (paper, cardboard, ropes of different diameters and materials, car safety belt, etc.). The factory sharpening has proved to be excellent and the cutting edge retention is satisfactory in relation to the steel used. To evaluate (always in a qualitative way) the resistance of the assembly system with Field Strip technology and the liner-lock mechanism, the opened knife has been repeatedly tested with vigorous strikes on the blade spine, trying to simulate any accidental bumps on the blade which may occur during use. Overall, the system has proven to be reliable, the locking mechanism is effective and the blade is free from play and firmly held in position. The knife was disassembled and reassembled more than a hundred times, and on all occasions all mechanical couplings were perfect without ever causing any kind of problems. Overall, the Homefront EDC is a good daily knife and, with the innovative Field Strip system, is able to offer a plus to all people who do not like disassembling their knife, especially the fear of losing the various internal components . Probably few will have the need to keep their knife clean in the field. Indeed many of us will be able to dedicate ourselves to cleaning and maintenance calmly at home but, for those who work in consistently dirty environments, this knife will surely be a good choice. The Field Strip also opens the doors to making the blades interchangeable, allowing you to choose the blade profile that you want to use during the day. Probably CRKT will have thought of this opportunity and, together with Ken Onion, will still be able to surprise us with other news.